A very comfortable, modern, quiet, bright apartment with 3 bedrooms, 2 bathrooms and 3 balconies, situated on the 4th floor of a new building with elevators. 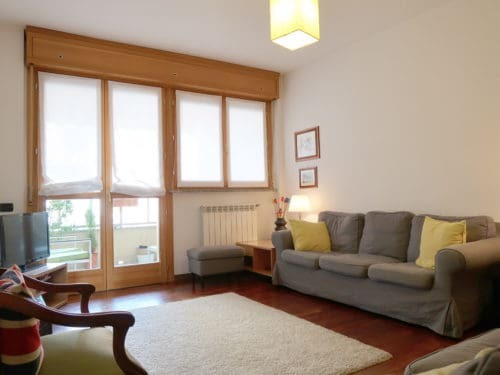 Entering the apartment, first on the left is the large, fully equipped kitchen, with table and chairs and access to balcony with garden view. Still on the left, is the first bedroom with double bed, large wardrobe and desk and the main bathroom – including bath tub. The corridor then leads you to the living room with 2 couches, large bookcase and TV. From the living room another corridor leads to a further 2 bedrooms, each with a single bed, large wardrobe and desk. Between the 2 bedrooms there is the second bathroom with shower. The apartment includes two large balconies (with seating and table) and one smaller balcony. Kitchen includes dishwasher, microwave, electric oven and hob. High speed internet/Wi-Fi also included. The apartment is within easy walking distance to Politecnico Bovisa Campus and Dergano metro station (yellow line/line 3). Piazza Duomo can be reached in less than 15 minutes on the Metro. Close proximity to the Metro line also means Bocconi University (Porta Romana, 20mins) and Marangoni (Montenapoleone 10mins) are also within easy reach. Cattolica University (Sant’Ambrogio) and NABA (Romolo) can also be reached by the Metro (travel time 30mins). Supermarkets, banks, gym, cinema, restaurants, lovely parks and many other shops and services are all within walking distance. Niguarda hospital (one of the largest in Milan) is also close by.